UPPSC Computer Operator Recruitment 2019 From 28th March 2019 All UP Candidates able to fill form of UPPSC Computer Operator Grade B Recruitment 2019 along with UPPSC Programmer 1 & 2. We have captured this notification from newspaper and frequently posted it online, so that you can get Computer Operator Jobs as soon possible. So below are some important guidelines. 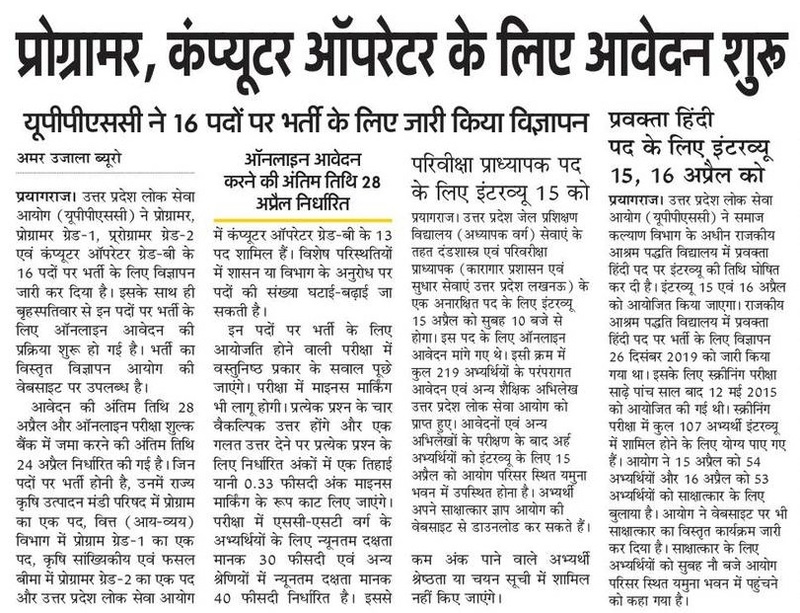 UP PCS Computer Operator Vacancy 2019: Latest News 28 March it contains Performa of Preliminary & Mains Exam, Selection Process, The exam centers name where UPPSC computer operator exam 2019 where it going to announce. The detailed advertised of UPPSC Computer Operator Notification 2019 will be visible when UPPSC upload full notification. Selection Process: Preliminary Exam, Mains Exam and Skill Test Computer Typing in English or Hindi. Computer Operator Grade B Eligibility: Graduate Pass in Any Stream with 1 Year Diploma in Computer or CCC, BCA MCA, A Level, O level. Age Limit: Minimum Age Limit to fill form of Computer Operator and Programmer jobs in UPPSC is 21 Year to 40 years. Submit your Computer Operator Application Form: 28 April 2019. UPPSC Computer Operator Syllabus 2019: As per News Detailed have said you to prepare from Books of Computer+ SSC+ Bank Level General Match, Reasoning, Hindi, Science, and General Knowledge etc. 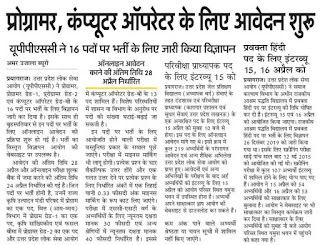 UPPSC Computer Operator Admit Card 2019: In the Month of June and July the written exam notification may come for Computer Operator Admit Card/hall ticket.